Signed as a free agent on May 10, 2018. Kasitati signed with the National Football League’s Washington Redskins as an undrafted free agent on May 16, 2016, and was released at the conclusion of training camp on Sept. 3, 2016. He then joined the practice squad of the Jacksonville Jaguars on Dec. 14, 2016. He signed a reserves/futures contract with the Jaguars on Jan. 2, 2017, and was released on Sept. 3, 2017. 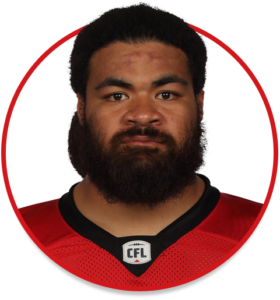 (Calgary) In his first season with the Stamps, Kasitati started a total of four games – two at centre and two at right tackle. He made his CFL debut in Week 14 in Hamilton as he got the start at centre. Kasitati made 25 starts in 42 games over four seasons (2012-15) at Oklahoma. He redshirted in 2011. As a senior in 2015, he started all 13 games at right guard for the Sooners and was named first-team all-Big 12. That season, Kasitati helped Oklahoma finish first in the conference in both scoring offence and rushing touchdowns. Kasitati attended Trinity Hugh School in Euless, Tex. He was named to the pre-season watch list for the Polynesian College Football Player of the Year Award heading into his senior season.